Umbra is a Bosmer warrior who can be found in the Ayleid ruin of Vindasel. She named herself after her sword, the powerful artifact Umbra. If the story seems familiar, this is because the sword Umbra also appeared during Morrowind, along with another character who had named himself after the sword. As part of his Daedric quest, Clavicus Vile would like to get the sword back. Years ago, Umbra's name was Lenwin, and she lived in Pell's Gate where she was Irroke the Wide's apprentice. She found Umbra, although where she located it is unknown. The sword's need for souls drove Lenwin to pick fights with and kill many villagers. When driven out of town, Umbra became a mercenary. She now appears to regret her actions and has retreated to Vindasel to prevent any further deaths. She spends all her time wandering around in the last room inside the Ayleid ruin. She never stops to even sleep or eat. However, if you challenge her, she is more than capable of defending herself. In addition to her sword, she also wears a full suit of Umbra's Ebony Armor. Her ebony armor is actually leveled. 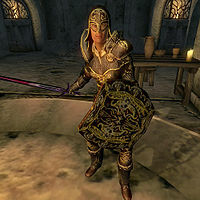 If you are at or above level 15 (the level at which ebony armor starts to appear in regular loot), you will receive armor with statistics identical to standard Ebony Armor. Below level 15, however, the health and armor rating are actually identical to Orcish Armor. The statistics are summarized in the following table. The second columns of numbers indicate the values above level 14. She also has her own "Umbra's Restore" ability, which effectively allows her to heal 2 points of health per second. The blade. It hungers for souls. Umbra shall feed! (only when attacked). Esta página foi modificada pela última vez à(s) 14h49min de 3 de maio de 2015.